If you’ve never heard of the IMF Special Drawing Right, you’re not alone. 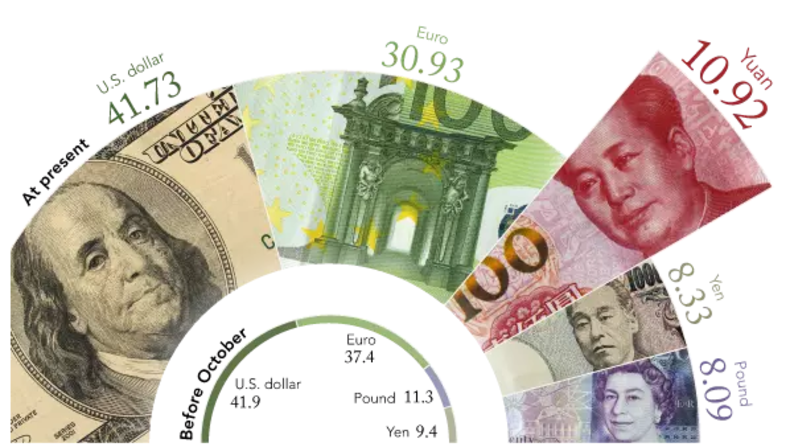 But it’s telling that this Who’s Who of Global Currencies welcomed in the yuan in 2016, despite its not meeting any of the four criteria supposedly demanded for admittance. 2016 politics may well have suggested that giving China a seat at the international monetary table would enough to assuage them into taking it slow when it came to the yuan’s world presence. But 2016 is now a political eon ago, and what was viewed as a small concession to China then may prove to be a crucial strategic detriment to US dollar hegemony now. The yuan was admitted to the IMF’s Special Drawing Right basket in 2016. This basket is made up of only five currencies. It includes the US dollar, euro, yen, pound, and yuan. The basket is broken down by weightings. The US dollar weighting is 42.73%. The euro, at 31.93%, sits in second place. The yuan, at 10.92%, ranks third, and is followed by the yen and sterling. The weighting is important because it reflects the influence of each currency in global finance. Which begs the question: Why did the IMF, a US-led institution, accept the yuan’s inclusion in the basket? Transparency and consistency in meeting IMF accounting and reporting standards. It’s arguable the yuan fails to meet any of these criteria. And yet it waltzed into the VIP club anyway. That’s because the yuan’s inclusion had little do with its usage in global finance. It was a political move. Otherwise, the US, and by extension the IMF, wouldn’t be accommodating the yuan’s internationalization as it has. And it almost certainly wouldn’t be giving China a leading role in influencing the future of the global monetary system. China’s moves to internationalize the yuan through oil markets should be seen in this context then. The Chinese are laying the necessary foundations in order for the next monetary reset to commence. It is no different to the arms build-up that precedes major wars. Every actor has to learn their lines before the show begins. This monetary reset could arrive at any point in the next five years. And almost certainly within the next eight years. The only ‘currency’ that will retain its purchasing power through this upheaval — because it never truly loses it — will be gold.